The brand is positioned as an expert in leather shoes with value proposition on its quality and design. Currently, the brand is running a campaign which to some marketers will be termed as bold. 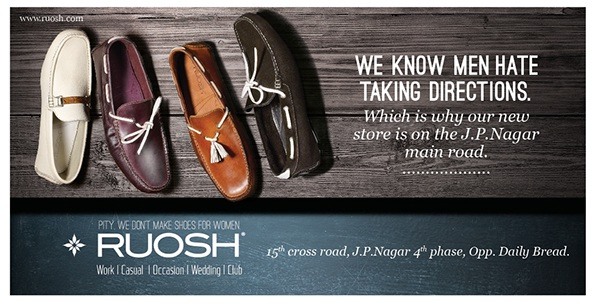 The communication used in its ad says “Pity, we don’t make shoes for women”. With a tagline like this, the brand is putting itself in a risk to attain short term gain. The risk is of creating an entry barrier for itself to enter into women shoe category in near future. Though the ad communicates its message clearly with elegance. In terms of pricing, RUOSH is priced a bit on the higher side at around INR 4500 + to compete with its counterparts like Red Tape, Woodland, Kenneth Cole, etc.